Well, this isn't the whole video, but if you go to Funny or Die, you can watch the whole hilarious thing. 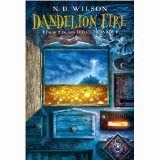 Madame L has just re-read all three of these books by N.D. Wilson: "100 Cupboards," "Dandelion Fire," and "The Chestnut King." "What?" Madame L's Dear Readers are asking---"Madame L has actually re-read three books? We thought Madame L didn't have time to re-read even one book, let alone three of them!" "Henry, Kansas, is a hot town. And a cold town. It is a town so still there are times when you can hear a fly trying to get through the windows of the locked-up antique store on Main Street. Nobody remembers who owns the antique store, but if you press your face against the glass, like the fly, you'll see that whoever they are, they don't have much beyond a wide variety of wagon wheels. Yes, Henry is a still town. But there have been tornadoes on Main Street. If the wind blows, it's like it won't ever stop. Once it's stopped, there seems to be no hope of getting it started again...."
"Kansas is not easily impressed. It has seen houses fly and cattle soar. When funnel clouds walk through the wheat, big hail falls behind. As the biggest stones melt, turtles and mice and fish and even men can be frozen inside. And Kansas is not surprised. "Henry York had seen things in Kansas, things he didn't think belonged in this world. Things that didn't. Kansas hadn't flinched." "Every year, Kansas watches the world die. Civilizations of wheat grow tall and green; they grow old and golden, and then men shaped from the same earth as the crop cut those lives down. And when the grain is threshed, and the dances and festivals have come and gone, then the fields are given over to fire, and the wheat stubble ascends into the Kansas sky, and the moon swells to bursting above a blackened earth." So, yes, the writing is poetic. Kansas, which many people think of as a very ordinary and flat place, is mysterious. 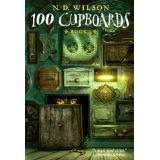 So when young Henry York finds a magical way through one of the 100 cupboards into a magical and even mysterious world, we go with him. And the plot equals the poetry and mystery of the writing. So do the characters. 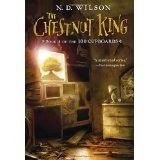 Henry York finds that he didn't really belong in New York, where he was raised; or in Kansas, where is spending supposedly only a summer; and even though he belongs in that other, mysterious, land on the other side of the cupboard wall, he has to work his way there, finding courage as he meets enemies and meeting love as he finds family. This is one of those books which, classified as a Young Adult novel, appeals to anyone who grew up reading and who still loves to read, anyone who has an imagination, anyone who has ever felt they didn't really belong where they were, anyone who has wanted to be tested, anyone who loves adventure, anyone who likes unusual and contrary and challenging and lifelike and funny and self-aware and oblivious characters. It's amazing that his show is making these videos publicly available on YouTube. They're all good. I liked this one not only for the way John Oliver covers the issues and facts, and is suitably outraged by them, but also because he uses the Muppets---or something like the Muppets---to sing the song at the end. You know how I said I was never going to look at a bike again, after the Huntsman 140? And now I've signed up to ride the 38-mile route in Ride Around the Sound on September 13. No, I'm not crazy, because I'll be doing this one with Jeff and Cory and Megan! Yay! This time I hope to be the one doing most of the driving instead of riding. I don't know yet how we're going to get our four bikes to the starting place in Tacoma, and then back home again, but we'll figure it out. I'm not asking for donations, though. (So please don't send donations! This means you, everyone who is reading this!) Just mentioning the ride because it's going to be so much fun. I especially love the sentence diagrams...and the difference between "lightening" and "lightning." Need a book to take to the beach? To your mountain cabin? On a cruise? To the local chlorine-scented swimming pool? This would do admirably --- especially if you are not embarrassed to be seen and heard laughing out loud. Madame L doesn't even remember if she has mentioned P.G. Wodehouse before. If not, shame on her! If so, she should continue to mention this writer of some of the funniest and most cleverly plotted stories Madame L has ever read. Until she stumbled upon this book in her local library the other day, Madame L thought she had read all of the Wodehouse stories. This one was new to her, though; and then she saw on the page before the title page a list of "Books by P.G. Wodehouse." The list takes up two columns, 10-point typeface, of that page. And about half of the books on the list Madame L has not read. Unfortunately, Madame L does not have enough vacation time to read all of these 70-some-odd books. And she feels guilty for having spent a couple of hours on this one. Jeeves and Bertie do not appear in this book, but that's okay, because they're not needed: the characters who do appear are funny enough and silly enough on their own. Oh, you want the plot? Here's the plot: Galahad Threepwood must save a star-crossed couple, in spite of the Empress of Blandings (a prize-winning pig); the Empress's fond-to-the-point-of-pottiness owner, Lord Emsworth; the Empress's caretaker; the machinations of Lord Emsworth's meddling sisters; the woman that one of Lord Emsworth's meddling sisters if trying to foist on him; the obnoxious son or nephew of that woman; the local policeman; and of course the young couple themselves. Wait, oh, do you mean, Dear Readers, you want to know the ACTUAL plot? Impossible. Read it and laugh. Read it and weep with tearful joy as you laugh yourself silly. Read it and laugh yourself so silly that the people around you on the beach or at the pool look at you askance. Show them the book, and know they are worthy to be your friends if they recognize the Wodehouse name. What if I Don't Want to Smile for You? Very provocative and true. We've all had something like this happen to us, haven't we! Hey, Mister Oblivious: It does NOT help me, or any other woman, have a happier day! straight after ones own achieving do that handy tip. one or two utility trades day to day. it is an honest metabolism great! (as a result the saying smash high-speed). It is getting ready to burn them calories from fat. dangerous to freedom and equality. World's tallest water slide---would you ride this? Not I! I haven't even ridden a very much shorter water slide. Here the slide's designer rides. Good for him. And he seems pretty blase about the whole experience, doesn't he. When they were first testing the slide, they used an empty raft. It flew off. This does not inspire confidence in me, even when I read, "If it has less than a thousand pounds in it, the raft is unstable." So, how many people are they fitting in each raft? Eight 125-pounders? Or what? Here's a refresher for the cellists on how to take care of their bows after this concert. Or maybe they just have to buy new ones? Madame L wants me to tell you: "Please write a five-paragraph, 500-word essay comparing and contrasting the two versions." Madame L loves this short short science fiction story and thinks you will, too. "They're Made out of Meat," by Terry Bisson, is available in full on the author's Web site. Madame L does not want to violate Bisson's copyright by putting the entire story here, so she hopes you will follow the link and read the story there. That's impossible. What about the radio signals? The messages to the stars?" So, this year's Huntsman 140 is over, and I'm still thinking of training, every day. I'm back at the gym in cycling class and other activities, and I'm starting a running program later this month. In short, I'm going to be doing even more training this coming year than in the last year and a half. How do I motivate myself to train, day after day, as much as I need to? If you focus on the ritual, the next step follows more automatically. But her ritual of waking up and calling the taxi takes the emotion, motivation, and decision-making out of the process. Her brain doesn’t need to waste any energy deciding what to do next. She doesn’t have a debate with herself about what the first step should be. She simply follows the same pattern that she always does. And once the pattern is in motion, the rest of the sequence follows more easily.